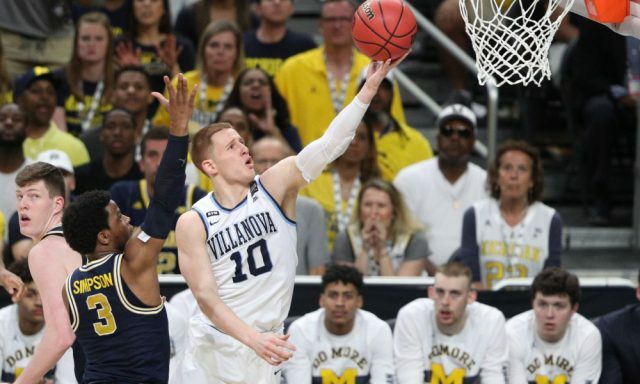 Like most freshmen, Donte DiVincenzo thought being on a big-time team meant he was big time, too. “The Michael Jordan of Delaware,” Villanova coach Jay Wright called him, and no one who heard it then could have mistaken it for a compliment. Turns out, Wright was onto something without even knowing it. The backup guard came off the bench to give the reeling Wildcats a lifeline Monday night and wound up getting them their second national title in three years. His 18 points in the first half turned the momentum of the game in Villanova’s favor, and his back-to-back three-pointers in a 52-second span in the second half provided an exclamation point to the Wildcats’ 79-62 victory against Michigan. DiVincenzo finished with a career-high 31 points, most ever by a non-starter in the championship game and most by anybody since 1989. Oh, he was named Most Outstanding Player of the Final Four, too. “He’s worked so hard to make himself the best player he can be every day,” Jalen Brunson said. “Honestly, this is nothing special — excuse me, this is very special. This is nothing surprising for us. We’ve seen Donte do this multiple times this year. It’s something of a tradition now, a guard coming off the bench to lead Villanova to the national title. Two years ago it was Phil Booth, who had a team-high 20 as the Wildcats beat North Carolina in the championship game. But this, this was something else. DiVincenzo was 10-for-15, including a blistering 5-for-7 from three-point range. After the last of his threes, he turned toward the camera and winked. Hey, when you’ve got game like Jordan, there’s no point denying it. Though DiVincenzo was the Big East’s Sixth Man of the Year and has had big games before — Gus Johnson hung the nickname “Big Ragu” on him after his tip-in basket beat Virginia last year — he’s spent most of the year in the shadow of Brunson, Booth and Mikal Bridges. But even if the rest of the country didn’t know what he was capable of, his teammates sure did. Two years ago, when Villanova was preparing for its Final Four matchup with Oklahoma, DiVincenzo was given the task of playing the otherworldly Buddy Hield on the scout squad. The freshman, redshirting after an injury, played the role almost a little too well, repeatedly lighting up his teammates. A better question might be how in the world can anybody expect to guard DiVincenzo? “Sometimes I think about if I’m a good defender or not because sometimes in practice he just makes me looks bad,” Bridges said. What makes Villanova so special is that it has an endless number of ways to beat you. There are a half-dozen Wildcats who can score. If the offense doesn’t kill you, the defense will. But early in the game Monday night, Villanova was struggling. After dropping three-pointers like it was a Pop-a-Shot contest Saturday night, the Wildcats couldn’t get any to fall. It wasn’t having much luck with 2-pointers, either. But after Michigan took a 21-14 lead on Moe Wagner’s layup with 10:59 left, DiVincenzo scored on a jumper to start a 23-7 run to close out the half. DiVincenzo had 12 points during the decisive spurt. Wagner made a layup to start the second half, but Villanova scored seven unanswered points and all that was left was to wait for the confetti. As the final seconds of the game ticked down, DiVincenzo’s teammates mobbed him and he threw the ball high into the air. The Michael Jordan of Delaware. The nickname has a whole new meaning now.